Get NEET 2018 complete guidelines. Check NEET 2018 application form, exam dates and syllabus. Stay updated with CBSE NEET UG exam pattern and eligibility. NEET 2018 is the national level examination for admission to MBBS & BDS courses. CBSE (Central Board of Secondary Education) is the conducting authority which organizes the NEET examination every year in various cities across the country. NEET exam is a gateway for admissions into medical & dental UG courses offered by various government and private medical colleges of the country. From the year 2016 onwards, AIPMT exam has been replaced by NEET examination. All medical institutions consider NEET score for providing admission in MBBS/BDS courses. 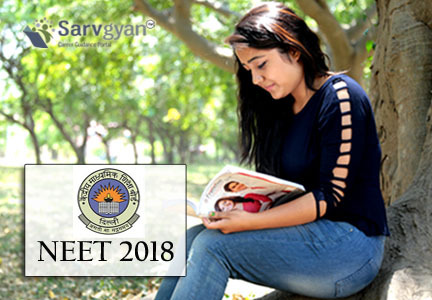 Through this article, students can get details about NEET 2018 exam including application form, eligibility, exam dates, exam pattern, syllabus, etc. J&K/AP/Telangana: Such candidates are eligible for All India 15% quota only (also eligible for admission in AFMC, Pune) on the basis of self declaration. Maximum Age: The maximum age limit is 25 years (for General and OBC candidates) and 30 years (for other categories). Exam Mode: Exam will be conducted through online mode (pen and paper based mode). Firstly, gather all the details about the officially prescribed syllabus for the examination. Consider the good preparation books and study materials. Practice mock test & previous year question papers. Stay stress free & healthy while preparing for exams. Don’t try to include new topics at the end of preparations. The answer key will be released within a week of examination. NEET Answer Key will be published via online mode through the website. Candidates may have an opportunity for online challenge against the answer key. Candidates have to pay Rs. 1000/- per answer challenged. The payment will be refunded in case of challenge is accepted by the Board. Cut-off is the minimum marks candidates are needed to qualify the examination. It will be based on number of students appeared in the exam, difficulty level and availability of seats. It will be released in the month of June 2017. The minimum qualifying marks should be 50% for general, 45% for general-PH and 40% marks for reserved categories. If you have any other queries about NEET 2018, you may leave your queries below.